Article courtesy of Mountain Warehouse. Hiking poles are of great appeal to trekkers, day walkers and backpackers, though many do not know how to use them to their best advantage. 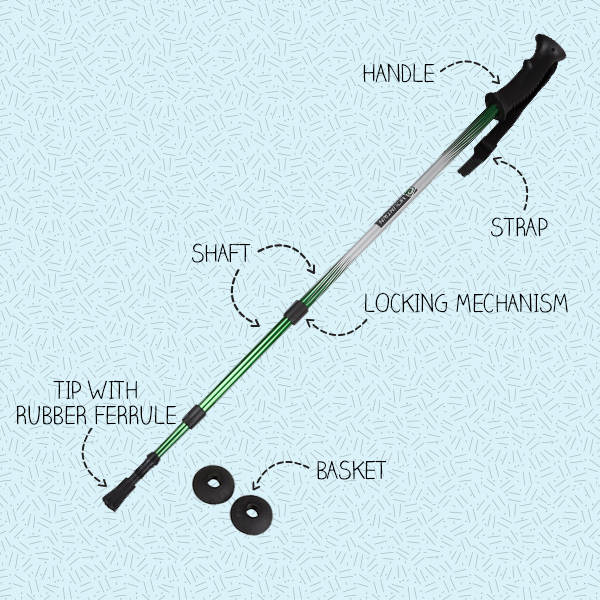 Read on to learn how to use walking poles correctly. There are several reasons to use walking poles when out walking or trekking. Walking poles help you move across terrain quicker, provide additional support and reduce the amount of effort required thus allowing you to achieve more during your walks. When used correctly walking poles can significantly increase your pace which has additional health benefits. You will increase your heart rate and oxygen uptake without feeling like you are expending vast amounts more energy. The workload will be spread across different muscle groups, not just your legs! Walking poles also offer increased support and stability on unfamiliar ground and uneven surfaces. The extra two points of contact with the ground will increase your confidence, especially if you are feeling a fatigued towards the end of your walk. Another great benefit of using walking poles is that they improve posture, especially important if you are carrying a load. Walking poles will make you more conscious of being upright whilst walking. There is a tendency to slump forward whilst going uphill which shifts your centre of gravity and actually increases the chances of slipping or stumbling on uneven terrain. The poles will help you keep your body position more upright so you can use your arms and shoulders to propel yourself up the trail easier. Firstly you will need to set your walking poles to the correct height, see How to Size Walking Poles for more information on how to do this. Next, open up the strap to a size whereby you can get your hand through it comfortably, but so it isn’t too loose. Pass your hand up through the loop and then grip the handle, the strap should cross the palm and “wrap” beneath the thumb. Using the strap this way enables a better connect with the pole and helps maintains control over the pole if your grip becomes slippery or you stumble. There is no definitive right or wrong way to use walking poles but there are ways that can help you use them more effectively. Most walkers use their poles inefficiently, bending their arms at the elbow and placing the pole tip slightly in front to use the pole as support. A more effective way is to keep your arm in a fairly neutral position (which is with a very slight bend) and use the shoulders to propel yourself forwards. Don’t grip the poles too tightly! Use a relaxed and loose grip on the poles, by using the straps as described above you maintain a good contact with the pole at all times. Use baskets on your poles when traversing softer or unknown terrain as this will stop the poles from sinking too far into the ground and give you far greater stability and support. Rubber ferrules are useful when traversing ground that the tungsten carbide tips cannot bite into – this will stop the tips from skidding across the surface. Try to use poles in pairs, whilst it can be said that one pole is better than no pole, using a pair will give you the greatest level of stability and control as well as improving posture. When travelling downhill position the poles slightly in front of you and engage the shock systems so as to lessen the impact of the fall of the hill. If you shorten your stride too, this will take some of the impact stress from the knee joints, especially important if you are carrying a backpack. If the terrain is very steep, icy or muddy, one useful technique is to walk down sideways, ramming the tip of the pole well into the ground and positioning the foot right up to it. 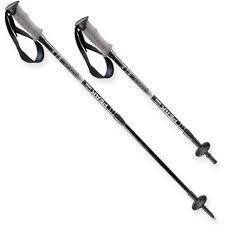 On steep uphill sections of your walks, shorten the poles slightly. You should be using the poles to push off not help pull yourself up hill so try not to plant the tip of the pole in front of your lead foot. If the tip is too far forward, you will be using your energy pushing the pole downward instead of backwards. Try to keep the poles reasonably close to the body to improve efficiency too.